Ally Financial Inc. has decided to apply the “Ally” name to most of its consumer and dealer-related auto finance operations in North America -- all but ending the GMAC brand name on the continent after a 91-year history of auto lending. The shift from GMAC to Ally will take place in August, the company said today. The corporation changed its name to Ally Financial Inc. in May. GMAC, traditionally short for General Motors Acceptance Corp., has been diversifying itself away from GM ever since it was spun off from the automaker in 2006. The Ally brand will be used to support the following manufacturers: GM, Chrysler Group, Saab, Thor Industries and Fiat Mexico. Ally's auto financing operations outside North America will continue to operate under the GMAC brand while the company evaluates using the new brand in other regions. The name change does not apply to the Suzuki dealer network. Ally is the preferred lender for Suzuki. When GMAC announced it would adopt the Ally name at the corporate level and possibly its dealer and retail operations, it considered continuing the use of GMAC for the products it supplies to GM dealers. Ally President Bill Muir said that despite the name change, the company's primary focus remains auto financial services. But GM's “junk” credit rating hampered its ability to raise low-cost capital to finance and operate another acquisition. The U.S. government owns 61 percent of GM and 56 percent of Ally Financial - formerly GMAC. "As we enter an exciting new chapter in GM's history, Ally remains an important partner and auto financing provider for GM customers,” Liddell said today. “We look forward to continuing that relationship." DETROIT, July 13 /PRNewswire/ -- Ally Financial Inc. (Ally) today announced that it will rebrand its GMAC consumer and dealer-related auto finance operations in the U.S., Canada and Mexico and begin using the Ally name. This follows the transition of the corporate entity to Ally Financial Inc. in May 2010. The rebranding of the auto finance operations in these markets will take effect during the month of August 2010. The Ally brand will be used for auto financing activities in the three North American markets, including activities to support the following manufacturers: General Motors, Chrysler, Saab, Thor Industries and FIAT Mexico. "While our name has changed, our primary focus and core business continues to be automotive financial services," said Muir. "Our dealer customers and auto partners can count on our ongoing commitment to their success." As one of the largest automotive finance companies in the world, Ally extended more than $16 billion of credit to retail customers in the first half of 2010 in the U.S., Canada and Mexico, which represents an increase in originations of more than 120 percent from the first half of 2009. For the first six months of 2010, the company extended an average of approximately $2 billion of credit per month to consumers in the U.S.
Chris Liddell, chief financial officer of General Motors commented: "As we enter an exciting new chapter in GM's history, Ally remains an important partner and auto financing provider for GM customers. We look forward to continuing that relationship." Richard Palmer, CFO of Chrysler Group LLC commented: "In taking over the financing of so many Chrysler dealers in such a short time Ally has shown itself to be a strong partner for Chrysler and our dealership network. Ally has proven to be a trusted and reliable source of financing with an in-depth knowledge of the auto industry." The company's U.S.-based auto finance products and services will transition from GMAC to Ally Financial on Aug. 23, 2010. The auto finance operations in Mexico and Canada will adopt the name Ally Credit on Aug. 16, 2010 and Aug. 23, 2010, respectively. There will be no change to current customer accounts or billing cycles. 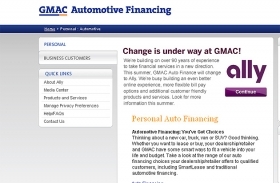 Ally's auto financing operations outside of North America will continue to operate under the GMAC brand as options for further use of the brand are evaluated. Ally Financial Inc. (formerly GMAC Inc.) is one of the world's largest automotive financial services companies. As the official preferred source of financing for General Motors, Chrysler, Saab, Suzuki and Thor Industries vehicles, Ally offers a full suite of automotive financing products and services in key markets around the world. Ally's other business units include mortgage operations and commercial finance, and the company's subsidiary, Ally Bank, offers online retail banking products. With more than $179 billion in assets as of March 31, 2010, Ally operates as a bank holding company. For more information, visit the Ally media site at http://media.ally.com/.